The Blackhawk! 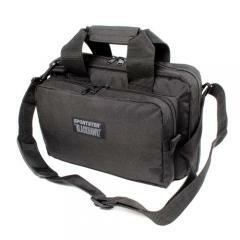 Sportster™ Deluxe Range Bag is a rugged case offering ample storage for handguns, ammo and safety gear. Made of 600 denier polyester with a PVC laminate, the bag integrates a dual slider top that opens to a large central storage compartment with varied interior pockets to organize essential gear. Specialized interior pockets accommodate up to two handguns and are lined with soft fabric to protect the firearms' finish. External side compartments provide additional storage space, one with inner mag pouches, the other with a removable padded handgun bag that fits in either side. An exterior slash pocket holds keys and a cellphone. Exterior MOLLE webbing offers further customization options for attachment of MOLLE compatible accessories and pouches. Sturdy reinforced handles and a removal shoulder strap provide versatile carry options that balance the weight load. The molded plastic bottom runners ensure the base doesn't touch uneven or unclean surfaces directly. For a high performance range bag, look to the Sportster™ Deluxe. Dimensions (L x H x D): 15" x 11" x 10"